The Canadian model was found dead in his apartment in Montreal, Canada, on Wednesday after an apparent suicide bid. 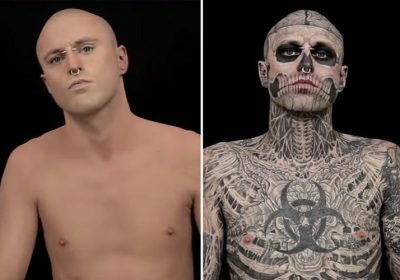 Famous for his appearance in Lady Gaga’s 2011 music video Born This Way, the heavily- inked star is unrecognisable in the advert for L’Oreal’s DermaBlend concealer and make-up remover. In the Go Beyond the Cover video, Genest, who was 32 when he died, is first seen sitting on a stool with a flawless face and chest as the slogan: “How do you judge a book?” appears. He then begins to wipe a cloth across his chest and, gradually, his skeletal tattoos begin to reappear. Next, a team of make-up artists surround the model and the film is speeded up as they set to work removing the concealer from his arms, face and body to finally reveal the full extent of his Zombie body art. Gaga revealed her friend had take his own life in poignant tribute on Twitter. His death was confirmed on Facebook last night by his agency Dulcedo Management, who paid tribute to the "icon of the artistic scene". It said: "The whole dulcedo family is shocked and pained by this tragedy. Zombie Boy, Rico, was loved by all those who had the chance to meet him and know him. "Icon of the artistic scene and the fashion world, this innovator, against popular culture, has been able to charm all hearts. "We want to present our deepest condolences and the legend will survive human. Thank you zb for these beautiful moments in your company and for your radiant smile." Lady Gaga urged those with mental health issues to seek help. Writing on Twitter, she said: "The suicide of friend Rick Genest, Zombie Boy is beyond devastating. "We have to work harder to change the culture, bring Mental Health to the forefront and erase the stigma that we can’t talk about it. "If you are suffering, call a friend or family today. We must save each other. "Sharing a set of snaps of the pair together, she continued: "Science tells us that it takes 21 days to form a habit, if you are suffering from Mental Health issue I beckon for today to be your first day or a continuation of the work you’ve been doing. "Reach out if you’re in pain, and if you know someone who is, reach out to them too." Genest developed his love of the macabre after being diagnosed with a brain tumour at 15 and told he was unlikely to survive surgery. But he did, and speaking to the Sun back in 2016, he said: “Even the doctors told me I got lucky.